Characteristics - Color saturation varies depending on application. Thin layers may be lighter and thick layers darker and more saturated. Some colors are "strikers" which may appear pale or even colorless in their cold form but "strike" or mature to target color when fired. Bullseye Glass is all hand rolled and will come with atleast one or two raw, rolled edge from the manufacturing process. Bullseye Glass is typically sold in 10"x10", 17"x20" and 20"x35" sizes +/-The photos of the glass on this web site are as close as possible. Due to camera and monitor displays the color maybe slightly different once you receive them. Shipping box fees apply. 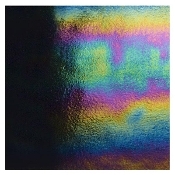 Iridescent coating may vary in appearance from edge to edge and from sheet to sheet. 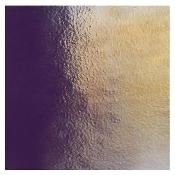 For example,black sheet with gold iridescent coating may only appear gold on two-thirds of the sheet or more, while the remaining area may show silver or magenta iridescent hues.